I see many references to the legal industry finding itself in a “new normal,” most prominently as the title of Patrick Lamb’s and Paul Lippe’s thoughtful ABA Journal column, but also in plenty of other places. I have used the term frequently myself. But what’s “normal” about the “new normal” in law? After all, normal means “conforming to a standard; usual, typical, or expected.” My sense is that there is a lot going on in legal practice these days that is unusual, atypical, and unexpected. So, not normal. 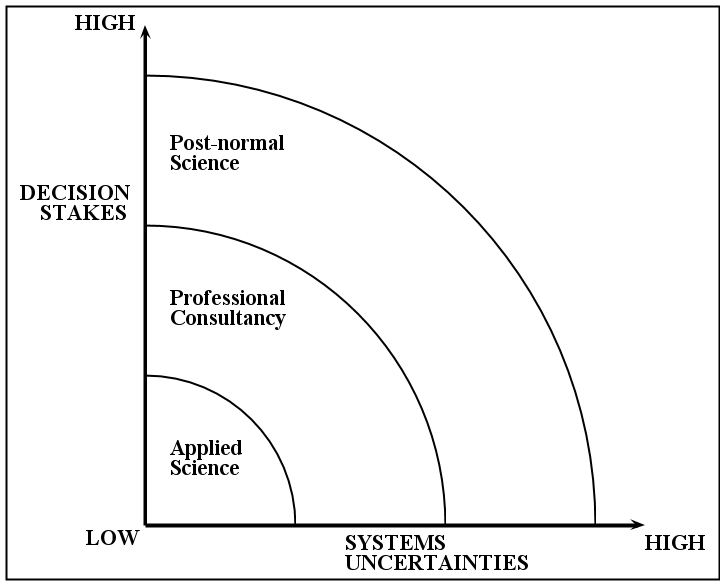 Applied science and other traditional problem-solving strategies do not work well in the context of long-term issues where there is less available information than is desired by stakeholders. Post-Normal Science advocates creating an “extended peer community” consisting of all those affected by an issue who are prepared to enter into dialogue on it. All that was ‘normal’ has now evaporated…. To have any notion of a viable future, we must grasp the significance of this period of transition which is characterised by three c’s: complexity, chaos and contradictions. These forces propel and sustain postnormal times leading to uncertainty and different types of ignorance that make decision-making problematic and increase risks to individuals, society and the planet. Postnormal times demands, this paper argues, that we abandon the ideas of ‘control and management’, and rethink the cherished notions of progress, modernisation and efficiency. The way forward must be based on virtues of humility, modesty and accountability, the indispensible requirement of living with uncertainty, complexity and ignorance. We will have to imagine ourselves out of postnormal times and into a new age of normalcy—with an ethical compass and a broad spectrum of imaginations from the rich diversity of human cultures. Ziauddin Sardar, “Welcome to postnormal times,” Futures 42(2010) 435-444. That sounds a lot more like the legal industry’s current predicament than “new normal” conveys. If so, are humility, modesty, and accountability at least part of the answer for law’s imagining itself out of postnormal times and into a new age of normalcy?